For value, variety and satisfaction…you haven’t lived until you’ve cruised! Cruises might seem like the easiest type of vacation to book on your own, so why call us? Our expertise and added on board amenities! Norwegian Cruise Line’s New Year. Big Savings. 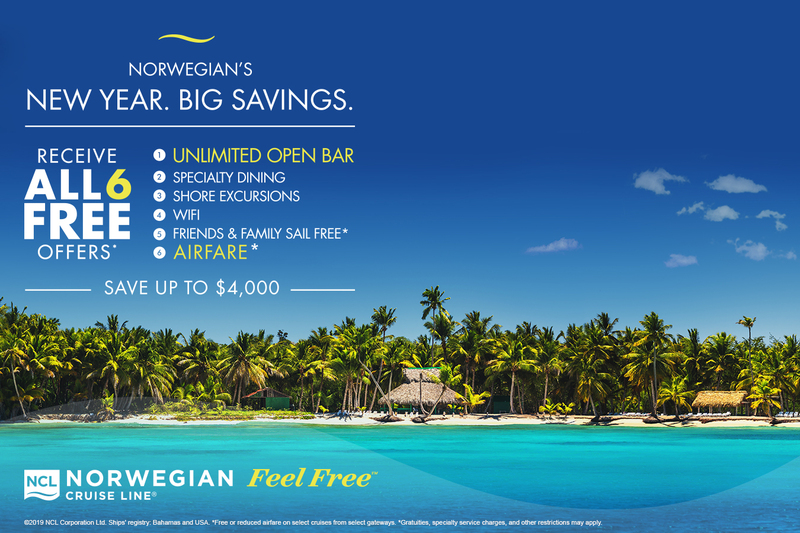 Limited time receive all 6 promotion over 1,000 sailings! Call us for details! Discover the # 1 River Cruise Line in the world! Sail roundtrip Amsterdam on the Tulips & Windmills cruise and admire the genius of the Dutch Masters at the Rijksmuseum. They can explore Hoorn’s seafaring heritage, Arnhem’s World War II history and Antwerp’s Renaissance splendor. Or, sail the Holland & Belgium itinerary to soak up Dutch and Flemish culture in key cities, with an overnight in Antwerp. The treasures of the Low Countries await. Contact Abacus Luxury Travel Service for more information! Take advantage of our cruise groups and access to Distinctive Voyages. These special cruises allow our guests to experience unique one of a kind shore experiences along with additional on board amenities. Call us with your preferred date of travel or destination and we will provide you with the best value! Terms and Conditions apply. Please call for complete details and availability.